DriveNow will offer for rent 300 BMW 1 series and Mini cars in Munich and 500 in Berlin. MUNICH -- BMW AG is introducing a car-sharing scheme in two German cities that will be extended across Europe and possibly to the United States. The German premium automaker has set up a 50-50 joint venture with Sixt, Germany's biggest car rental company, to run the scheme. The venture is called DriveNow and it aims to win 1 million customers by 2020. BMW joins Daimler AG and PSA/Peugeot-Citroen SA in launching short-term rental offers that give people access to a car without the cost of ownership. BMW sales and marketing chief Ian Robertson said the venture is an answer to the trend away from car ownership in big cities. "We are aiming to launch a profitable new line of business while at the same time introducing potential new customers to our brands," he said at DriveNow's launch in Munich on Monday. Robertson said DriveNow customers will be able to rent a car "on the spur of the moment" if they need the vehicle for a trip into the city or a day out. DriveNow will launch April 1 in Munich and shortly after that in Berlin. BMW said further European cities will be added in the coming years and the long-term plan is to introduce DriveNow on other continents, although Robertson declined to reveal when the scheme might launch in the United States. The scheme will offer for rent 300 BMW 1 series and Mini cars in Munich and 500 in Berlin. Other models will be added later depending on demand. The cars will be parked at different locations around the cities. Drivers will be able to book them on the Internet or with a smartphone app, then access the vehicle with a chip embedded in their driver's license. 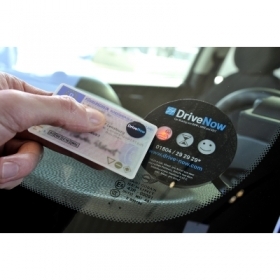 DriveNow cars are accessed using a driver's license. Robertson said car sharing also has a role to play in helping the environment by reducing traffic volumes and providing an alternative replacement for little-used, old and inefficient vehicles. He added that BMW plans to rent its new all-electric vehicles as part of the scheme in the future. The EVs are due to arrive in 2013. Peugeot established a car-sharing scheme called Mu in cities in France, Germany, Italy, Spain, the UK and Belgium last year and aims to expand the service to most European cities with 300,000 or more inhabitants by the end of 2013 as it seeks to become market leader. Mu customers can rent Peugeot cars, EVs, work vans, or even scooters and bicycles, by the hour or day. Daimler plans to expand the Car2Go car-sharing scheme it has tested in Ulm, Germany, and Austin, Texas, to Hamburg in April and other cities in the next two or three years. Under the scheme drivers can rent a Smart ForTwo for short or long trips.